The emergence of 7-on-7 football along with elite training facilities and programs have certainly played a role in the continued emergence of Massachusetts football over the past decade, but Will Croom believes there’s another big factor that may be overlooked despite receiving more attention in the football world than anything else in the region. Croom, founder and head coach of Mass Elite 7V7, read an article years ago that predicted this rise was coming based on the perennial success of the New England Patriots. “The article was talking about what happens when a pro team comes to prominence and that respective franchise starts to focus on grass roots,” says Croom. As the Patriots have risen to prominence, there’s been a steady rise in the amount of legitimate Power-Five prospects from Massachusetts and the New England area in general with additional attention for frontline stars like Clemson defensive lineman Christian Wilkins and Boston College running back AJ Dillon. The Class of 2020 is loaded at the top by Massachusetts standards with prospects like Zak Zinter, Cam Large, Kalel Mullings, Kevin Pyne, Jay Brunelle and Eamonn Dennis, but it’s also deep. “It’s not just one or two kids getting looks,” said Croom. “This Class of 2020 is really going to set a record for up here. I’ll bet my bottom dollar, we’re going to have about 33 kids signing FBS and I’m probably low-balling it. Croom points to the support the Kraft family has lent to youth football through camps and programs along with hosting high school state championship games at Gillette Stadium. Still, nothing can mimic the success the Patriots have had, winning six Super Bowls and reaching nine altogether over the last two decades. There’s still a ways to go and Croom, who also coaches at Middlesex School, and many other coaches in the state are hoping the Massachusetts Interscholastic Athletic Association will eventually do more. “I wish the MIAA would catch up to that and give these kids spring football to bring us up to speed,” says Croom, who played at the University of West Georgia. ND-FRIENDLY STATE: Not only is the number of players in Massachusetts and New England increasing, but the elite academic prep schools in the region are placing more of a premium on athletics. 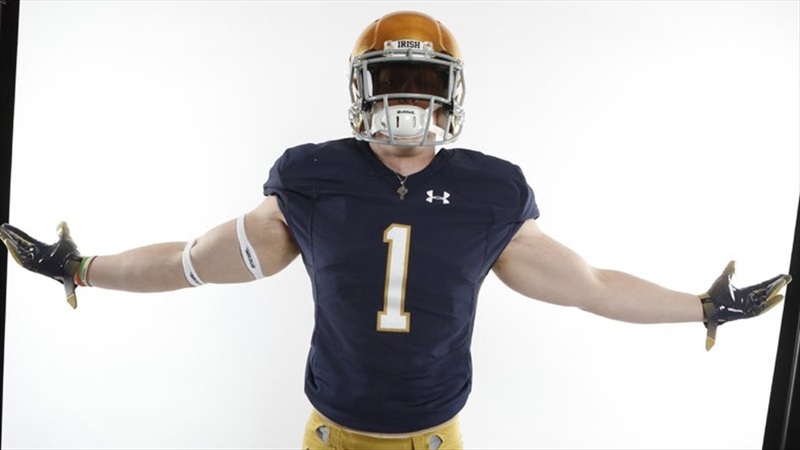 Kids and family who seek out competitive academic and athletic situations for high school are extremely likely to be intrigued with what Notre Dame offers on the next level. Schools like Notre Dame, Duke, Northwestern, Stanford and Boston College are well aware of the potential fits, according to Noble & Greenough head coach Panos Voulgaris, who spent six years in a similar environment at Episcopal High School in Virginia. “They know a place like this or Episcopal is a high-academic place,” Voulgaris said of recruiters at top academic colleges. The state has a pair of FBS programs in Boston College and UMass, but there are plenty of Irish fans in the area, if not more as evidenced by the strong support Notre Dame garners when it plays in the Northeast even in the territories of their opponents. 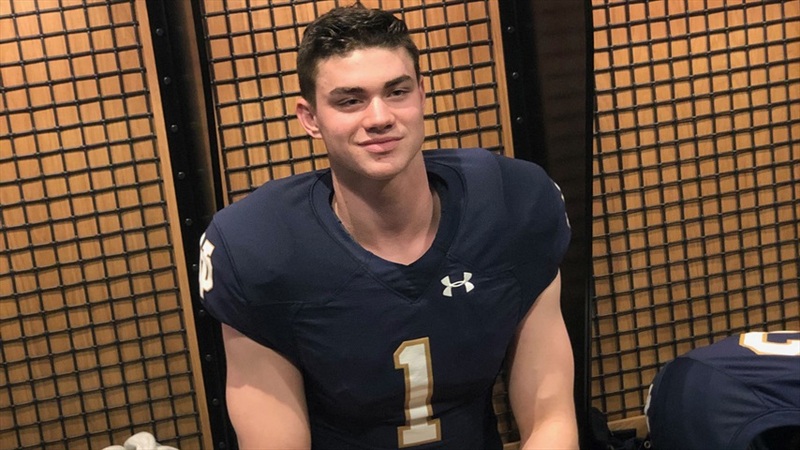 BRUNELLE READY TO WORK FOR IT: After spending time watching Jay Brunelle‍ working out earlier in the week and speaking with his trainers at Exceed Sports Performance, we spoke with another source who has worked with the 2020 Massachusetts wide receiver in the past. He confirmed everything we heard and saw. “He’s a worker bee,” the source said. “He always has been. This source also credited his father, David, who played football at Colgate and was inducted into the Worcester Public High Schools Athletics Hall of Fame, with supporting his son. But still noted that it has to be the kid’s choice. We’ll get a good look at Brunelle’s speed at the The Opening Regional in New Jersey on Sunday, but this source expects him to run in the 4.5-range. MORE MASS. KIDS COMING: While Cam Large‍ (pictured at the top) is receiving all of the attention at Noble & Greenough now, Voulgaris has a couple 2021 prospects already receiving national attention in offensive lineman Drew Kendall and linebacker Casey Phinney. Kendall already has offers from schools like Michigan, Duke, Maryland, Virginia, Boston College and Syracuse. Phinney is a 6-foot-1, 235-pound linebacker. “He’s strong, fast, extremely physical,” said Voulgaris. He has early offers from Michigan, UMass and Boston College. Voulgaris said both are excellent students who would be interested in what Notre Dame has to offer. CROOM HAS PLAYERS IN PIPELINE TOO: In addition to Large, Croom has worked with a pair of the region’s top quarterbacks, Brady Martin, who is committed to UMass, and Parker McQuarrie, who is actually from New Hampshire and recently committed to UCLA. Croom also works with Hunter Lane, a 2020 wide receiver/tight end/defensive end prospect, who is doing a post-grad year at Phillips Andover, another elite prep in the state. The 6-foot-4, 220-pound Lane is the son of former New England Patriot offensive lineman Max Lane. But Hunter played soccer and other sports growing up and had been focusing a lot of attention on basketball, but is now starting to gravitate toward football.